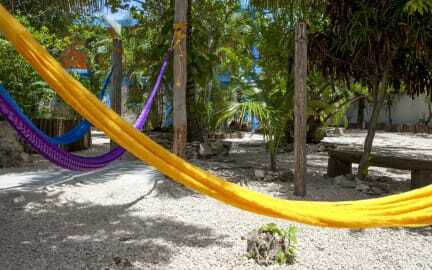 ' La Negrita ' is located in magical Tulum, the hostel reflects the essence of the Mexican Caribbean, the style house is based on ancient Mexico traditional architecture, surrounded by a beautiful tropical garden with palms and fruit trees with hammocks and seating, which invites you spend time in its relaxing and natural environment. Within five minutes walk you will find a world of options wide and rich gastronomic variety, within around 10 minutes you will be in the heart of the town. You will discover a beautiful sea of spectacular white sands and turquoise water by car in less than 15 minutes, by bike 30 minutes or by collectivo in the centre of town. Spacious common areas, inside and in the garden. Beautiful place. Friendly staff. Would highly recommend! The lady at the front desk is an absolute gem! 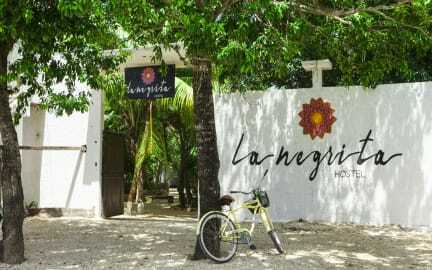 Very accommodating and great at helping you think of places to go in Tulum. This place was awesome! An oasis in Tulum! Beautiful hangout space, pool, sun and shade throughout the day, a 15 min walk to the ADO bus, bikes for rent, lovely staff, simple, but nice breakfast for free. WOULD STAY AGAIN IN A HEARTBEAT! Loved my stay here! was at another hostel before coming that didn’t fit what I wanted but have loved my stay at La Negrita! Very homey and relaxed, the people who run it out so sweet and loved that they had bikes because they are a must in Tulum. Breakfast every morning was decent usually eggs with toast or pancakes super simple bits helps when your penny pinching. Location was decent walking distant to main street and was off enough so wasn’t loud at night and enjoyed that a lot! Beautiful hostel, with a lovely little garden and pool. Beds and dorms are great as well. Is very quiet though so not great if you're solo and wanting to meet people. Nice place and great staff. The big dorm you can barely walk through without hitting bunks - it’s overfull and would be hell if at capacity. The hostel is incorrect on maps (including the auto email and Maps.me). I told staff and they just shrugged. I think they’ve told the owner multiple times and it still hasn’t been sorted, but that sort of reaction is infuriating, especially when you’ve been walking round in circles trying to find a place for 20 mins. It’s not rocket science just fix it! Very nice, friendly staff who cooked us eggs and toast every morning. Super chill hostel in a small town so no worrying about stuff being stolen so just put valuables in the small lockers. Only downsides was the shower was very weak and hardly had hot water (not much of a problem when the rooms are above 27c most of the time, and unfortunately there was loads of little bugs crawling around in the sugar bowl so sweetening coffee wasn’t an option. That aside, lovely chilled out, safe hostel. Awful. Bunk beds were crammed into the room so that 2 people could barely be in there together. You could not sit up in bed on bottom or top bunks. Lockers were not big enough for a standard-sized travellers backpack. Doors to rooms only locked from the inside. The facility had 1 toilet, and 1 working shower in 1 room - so if one of the twenty-odd guests were showering, you couldn’t pee. Wifi was inconsistent. Lots of outdoor shared space with many hammocks the only plus. Do not recommend.